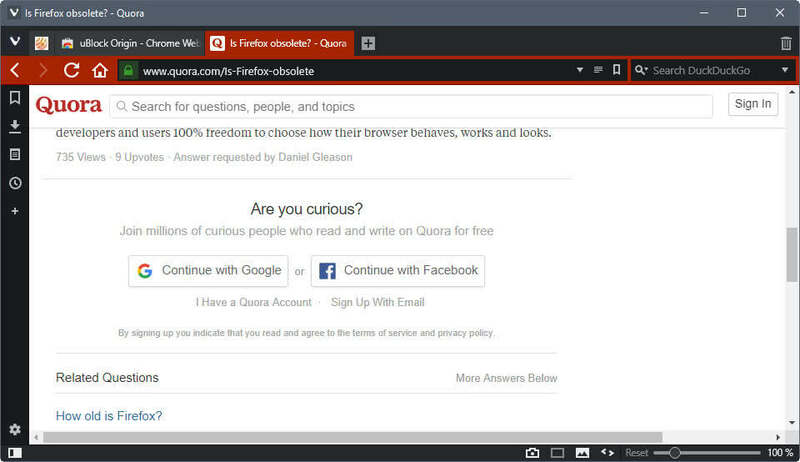 If you use the browser extension uBlock Origin, available for Firefox and Chrome-based browsers, you may browse Quora.com without account. Quora.com is a community site that is well frequented. It is a question and answer type site that is described as a "place to share knowledge and better understand the world". While anyone may access pages on Quora, only the questions are visible on pages for users who are not signed in to an account. We detailed back in 2013 how to access answers on Quora.com without signing in. I checked out the site recently again in preparation for an article, and noticed that I could access all question and answer pages on the site without signing in to an account or enabling any of the bypass options mentioned in the 2013 article. My first thought was that Quora lifted the restriction, but a quick check in other browsers revealed that this was not the case. This sparked my interest, and I decided to disable the content blocker uBlock Origin in Chrome -- the browser that Quora.com worked in without sign in -- to see if it was responsible for that. Turns out it was. As soon as I disabled uBlock Origin on the website, the usual "Are you curious. Join millions of curious people who read and write on Quora for free" was displayed which prevented me from accessing the answers to questions on the site. When I enabled uBlock Origin again, the answers were displayed again and the forced registration popup on Quora.com was removed automatically on all pages that I visited. I decided to test this in other browsers, and it worked each time. So, if you are using uBlock Origin already, there is nothing that you have to do in order for you to view Quora answers without being forced to sign in to the site. Users who don't want to install uBlock Origin for that may check out the other methods published in the 2013 guide linked above. It should be clear that this comes down to reading answers only. If you are not signed in, you cannot use any of the other functionality that requires an account. Also, you cannot use the Quora homepage as an entry point to the site as it won't let you in this way without account. Just visit one of the topic hubs, e.g. https://www.quora.com/topic/Mozilla-Firefox instead and use the search on those pages then to browse the site. Just a quick tip for the weekend. You can browse Quora.com without account to read all answers if you use the uBlock Origin extension. Very good tip, thanks a lot ! I still have the usual “Join if you want to see answers” thing even with uBlock Origin installed when I’m logged out of Quora, so it’s most likely depended on some kind of filter you’ve enabled. Strange, I tested this with a brand new uBlock Origin installation in Opera, and it worked without changes to the config. In which browser did you test this? Did you disable the filter list “uBlock filters”? It contains the cosmetic filter which takes care of the sign in/up wall. Alternatively, is cosmetic filtering disabled on your side for that site? uBlock Origin isn’t necessary actually since you can browse the site with ABP enabled as well. While you can’t use the Quora homepage you can use their site map page (https://www.quora.com/sitemap). Shhhh! Don’t write about it or Quora will read it on ghacks and block it! Haha that’s what I thought so. Well it’s not limited to Quora tbh I’ve also avoided the restriction on other websites using uBlock Origin. Just loving it! “a n” should be “a”. Social annoyances blocklist is pretty Godly as well. Carry on. I don’t think the lack of the Quora signup overlay has got anything to do with uBlock Origin, blocking filters, or in fact, any addon at all. My HDD is offline, so I’m currently using Firefox with no browser addons from a Ubuntu LiveCD. And sInce I’m on LiveCD, there is also no HOSTS file or firewall to block specific URLs either. The only tweak I’d made to this “out of the box” Firefox is to block all cookies. And despite browsing dozens of Quora answer pages, I have not encountered any Quora signup overlay. This is regardless of whether I land on a Quora answer page by clicking a link from an external search engine (note: the URLs are not appended with “?/share=1”), from Quora’s internal search results page, or from a Quora question/answer page.